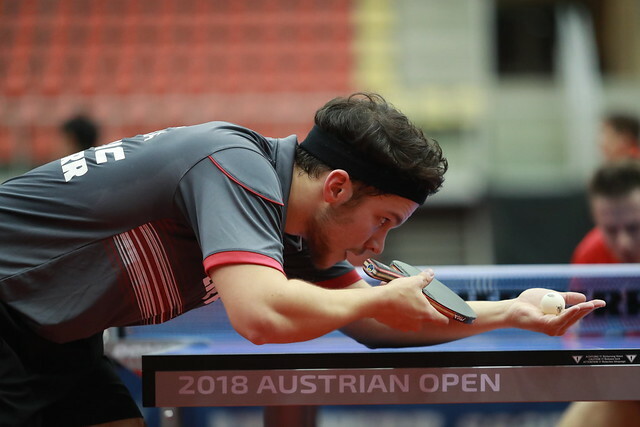 Success five days ago in Stockholm, on Friday 9th November at the quarter-final stage of the Men’s Doubles event at the Seamaster 2018 ITTF World Tour Platinum, Liebherr Austrian Open in Linz, it was defeat for Chinese Taipei’s Liao Cheng-Ting and Lin Yun-Ju. The no.6 seeds, they suffered at the hands of Japan’s Masataka Morizono and Yuya Oshima, the no.2 seeds (11-6, 11-9, 7-11, 11-3). Defeat but prior to the start of play, as with Masataka Morizono and Yuya Oshima, Liao Cheng-Ting and Lin Yun-Ju had already reserved their place in the Grand Finals to be staged from Thursday 13th to Sunday 16th November in Incheon, Korea Republic. Success as seeding predicted, it was the same for the Korea Republic’s Jeoung Youngsik and Lee Sangsu, the top seeds, as it was for Hong Kong’s Ho Kwan Kit and Wong Chun Ting, the no.3 seeds. Jeoung Youngsik and Lee Sangsu accounted for China’s Fan Zhendong and Wang Chuqin, the no.5 seeds (12-10, 7-11, 11-8, 11-9); Ho Kwan Kit and Wong Chun Ting ended the hopes of qualifiers Japan’s Tomokazu Harimoto and Yuto Kizukuri (12-10, 7-11, 11-8, 11-9). Moreover, the result not only ended the hopes of Tomokazu Harimoto and Yuto Kizukuri in the current tournament, it ended their hopes of a place in the Grand Finals; they started the tournament in an overall 25th position (75 points). If they had progressed to win the event they would have deposed Sweden Mattias Falck and Kristian Karlsson; the Swedes who withdrew from proceedings in the opening round, started and finished the tournament in eighth place (301 points). Progress for seeded pairs, in the one remaining quarter-final contest by definition a qualifier had to advance. Both combinations required to compete in the preliminary rounds, the partnership formed by Romania’s Ovidiu Ionescu and Spain’s Alvaro Robles accounted for Belgium’s Martin Allegro and Florent Lambiet (11-6, 11-9, 11-7, 11-8). At the semi-final stage Jeoung Youngsik and Lee Sangsu meet Ho Kwan Kit and Wong Chun Ting, Ovidiu Ionescu and Alvaro Robles face Masataka Morizono and Yuya Oshima; the matches will be staged later in the day during the evening session of play.